The HDX30L fits the following Harley Davidson Models; Electra Glide 1997-2016, Road Glide 1998-2016, Road King 1997-2016, Street Glide 2006-2016, Tri Glide 2009-2016, Ultra Classic 1997-2016. Replaces following OE Harley Battery numbers; 66010-97A, 66010-97B and 66010-97C. The HDX30L is made in the same manufacturing facility as the Original Equipment Harly Davidson Batteries. The key to AGM technology is highly porous microfiber separators which completely absorb and trap the acid making this battery spill and leak proof. It is factory fresh and guaranteed to fit your Harley. 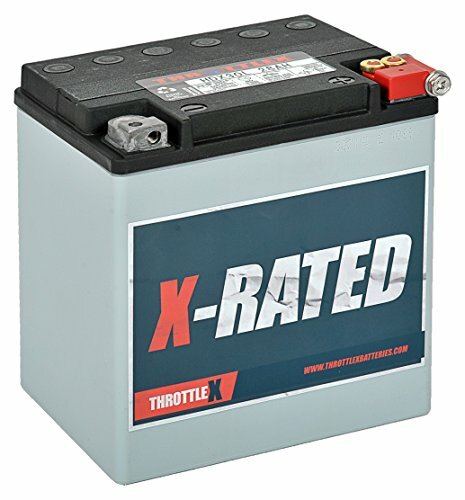 The HDX30L is one of the most popular batteries ThrottleX offers and an all time customer favorite that has made its mark within the Harley Davidson riding family. With ThrottleX just buy and ride. With confidence! Same Quality and Power as Original Equipment Battery - 400 CCA and 28 AH. Dimensions: L = 6 5/8, W = 5 3/16, H = 6 7/8. Weight - 23 lbs. AGM (Absorbed Glass Mat) Non Spillable Sealed Technology With Heat Sealed Cover and Patented Solid Lead Female Threaded Terminals. New Stainless Steel Bolts Included! If you have any questions about this product by ThrottleX Batteries, contact us by completing and submitting the form below. If you are looking for a specif part number, please include it with your message.